I finally have a quiet moment from the busyness that is three children. Arthur is sleeping next to me and here I am writing my induction story with him. I look back at that day, now a whole 5 weeks ago with such happiness. I feel so grateful to have had such an amazing birth experience and that everything went so well and I am here with a healthy and happy baby. I couldn’t ask for anything more. I feel very lucky. 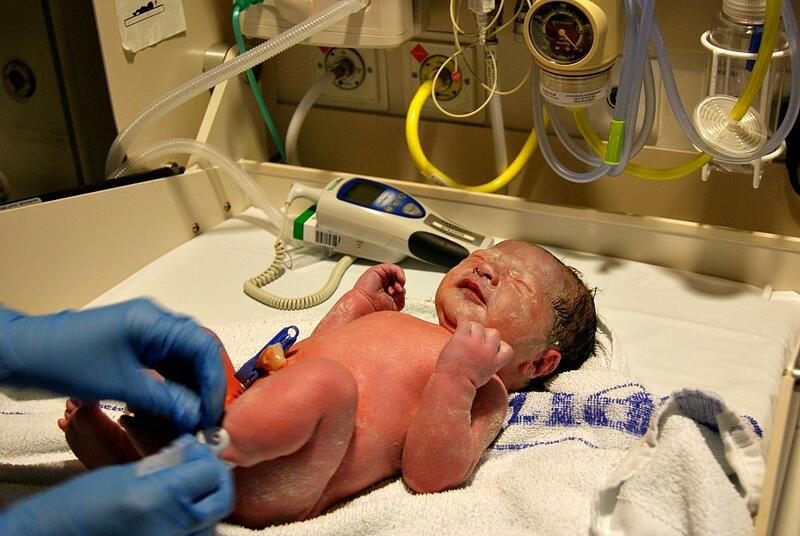 Its not everyday you give birth or have a baby, so to me its the most amazing and most special experience. Although pregnancy and birth can be tough and everyone has different experiences, even so, the whole cycle the moment you find out you are pregnant, to then carrying your baby, and then to birthing your baby and seeing them in your arms for the first time has to be the most amazing experience. I do feel so privileged I have been able to do it three times. This time round It has become even more apparent to me the power of our minds and our bodies. I have always known this but its never more apparent in childbirth. A healthy mind, a positive mind, where you trust that your body can do this is a tool that you will never take for granted. I owe a lot to Sophie Fletchers Hypno birthing audios for helping to relax me and to rewire my mind about childbirth (since Archie’s birth was quite traumatic) in her audios telling me that my body can do this safely and that it knows what it is doing. To remember each contraction is brining me closer to meeting my baby. Those exact words kept me going throughout. Even just writing that down makes me feel so grateful to have had Arthur and for us both to be healthy and well. Previously I have had two natural births with Sophia and Archie. Archies Birth was a little traumatic for my husband and I. My pregnancy with Arthur was fantastic but it didn’t stop me from feeling extremely anxious and watching all of the signs and making sure he was okay inside there. It is only towards the end of my pregnancy around 34 weeks that I became anxious. My doctor decided that I should be induced due to having reduced fetal movement. I really struggled to feel Arthur move at the end. It was quite scary for me and I became obsessed with checking his movements. For that reason and for my mental health my Doctor thought it would be best to induce me early, I was happy with this as I had had early labour signs at 36 weeks which didn’t end up progressing. I was 37 weeks when they booked me in for induction on the 4th of December. I was due on the 21st of December from the date of my last period and at my 12 week scan they re dated me, and my due date was changed to the 15th of December. I went in to be induced on the morning of the 4th of December 2017. I had all my bags packed and ready and I couldn’t wait to go and meet my little boy. The one I had carried so carefully inside me always waiting for his little kicks. When he pushed his little feet against my belly I would place my hand there and rub his foot for quite some time, he never pulled away andI like to think that he quite liked it. Those will always be such special memories for me. Its very true that the bond with your baby starts from the moment they are created. 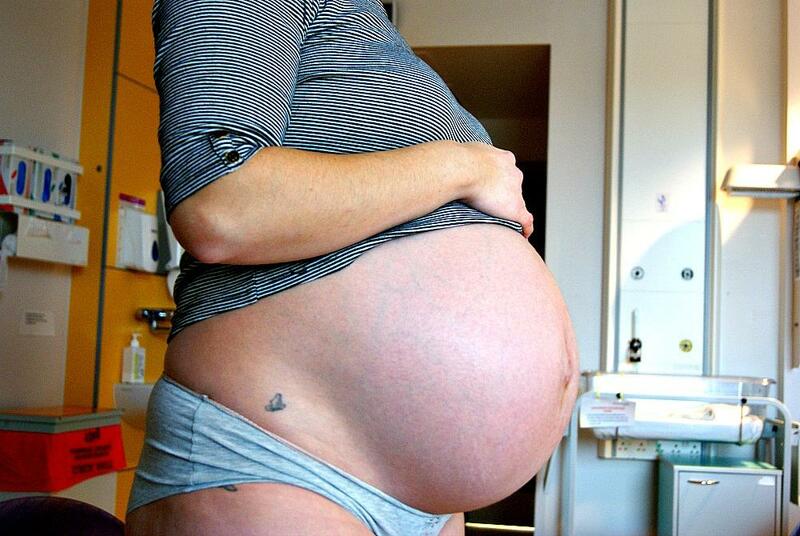 I have never been induced before and I honestly had no idea how lengthy the process could be. I expected to go in and have a baby within two days. I knew that once my body was in active labour it would be fine and things would progress quite quickly. Within a few hours of being in hospital I had the 24hr propess inserted and that was left in till the following day. I did experience some contractions but although they were regularly for a couple hours they never progressed. The following day I had the 6 hour gel that also gave me really sore and regular contractions for a couple of hours but didn’t send me into active labour. I was then checked after the gel and they said on the 5th of December I was ready for delivery suit so they could break my waters. However I think they were very busy and quite under staffed so I had to wait until they could take me over. I didn’t realise how long I would be waiting and was only taken over at 12 midday on the 7th of December. By this point I was very fed up and before they called me to go to delivery I was ready to leave although I wouldn’t have done I was just so fed up and frustrated with being in the hospital with no progress for that long. I cried a lot and I just wanted to get home to my other babies. I missed Sophia and Archie so much. I was feeling so anxious to get to them and I was just a huge bundle of nerves. On the morning of the 7th of December I was finally called in to the delivery suite. At this point I felt so relieved and excited knowing I would have my little baby very very soon. The last few days of waiting and waiting, and waiting were made so worth it when my midwife opened my door and said: “they are coming to get you, you are going to delivery, so get yourself ready and your bags”. Dan had actually gone home to go back to work that morning at 10am (I had told him to leave as I had no faith I was going in that day) and I ended up having to call him back at 12 to tell him I was going into delivery. He arrived back at about 1 and about 1.30pm I had my waters broken. I had the senior doctor do this and she gave me a sweep as well. I had the gas and air while they broke my waters as I was just 2cm dilated at that point and I had been checked internally so many times over those four days I was quite sore. They said if nothing happened after two hours they would then start the drip. 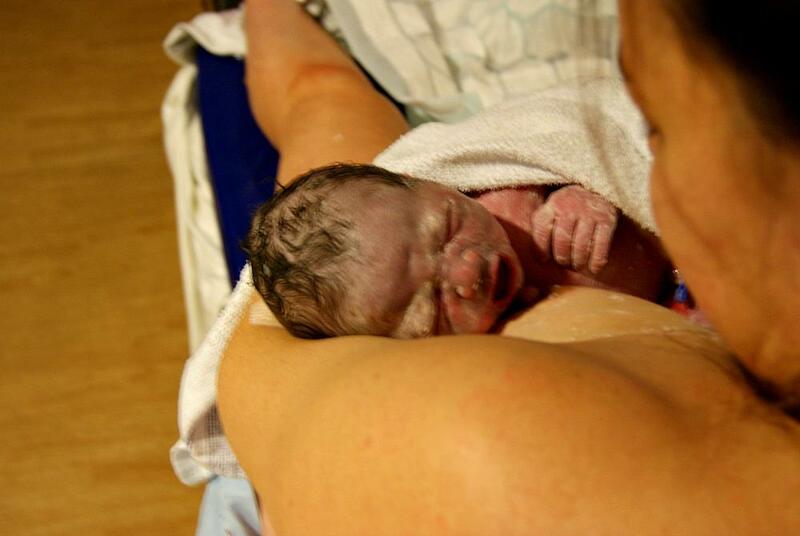 At around 3.30 they started the drip and every 30 mins my midwife up’d my dosage. She checked me at about 5 o’clock and I was 4cm so she gave me pethidine. 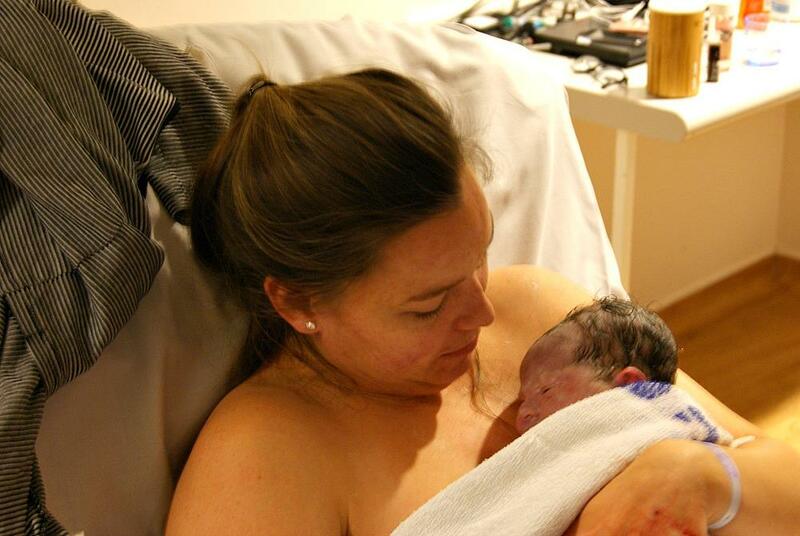 I had asked for this before I went into labour as I was petrified of the pain and didn’t want to have an epidural. Knowing I was having pethidine did put my mind at ease a quite a bit. I then went from about 4cm to fully dilated within the hour. I remember having the urge to push and I just went with it. I could hear the midwife telling me to stop as she hadn’t checked me and it had been quite quick but I had no control over it. My body was just pushing and I couldn’t stop. 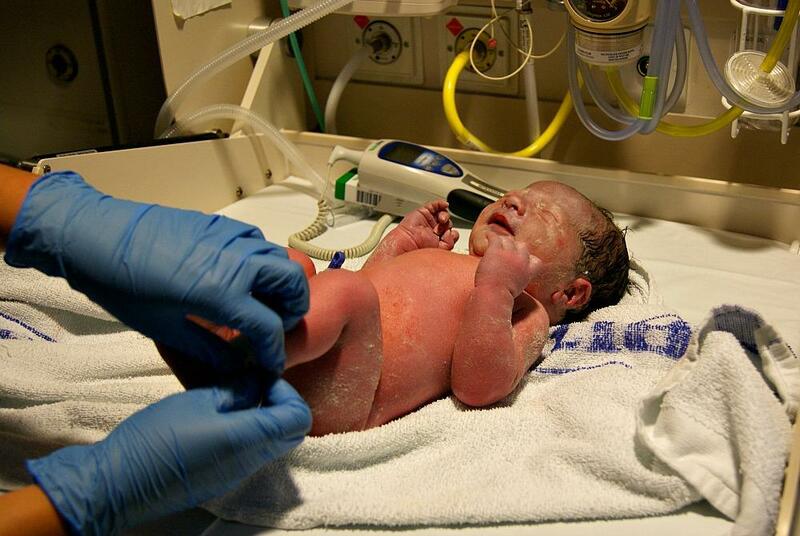 I remember my midwife panicking and checking me at this point and she felt the head and said oh the baby is coming. And then another midwife was called into the room not that I remember that but when I had given birth I saw the other midwife in the room. Quite shockingly I pushed him out in 4 minutes. Just like I did Archie. It did feel quick when I was pushing him out. I remember when his head was out I reached down and felt it. I had never done this before but it was amazing to actually be able to do it this time and I remember his head felt so tiny. He came soon after that and my beautiful Arthur was born at 6.16pm on the 7th of December 2017. My precious boy. Who from the moment we decided we wanted a third baby has brought an amazing about of joy and love into our family more then I ever knew possible. His brother and sister dote on him and never leave him alone. They are so caring. And one of the loveliest things about having a third baby with children who are a little older is watching how caring they are. They help get his nappies change him and choose his clothes for the day. And their enthusiasm is such a joy to see, they really do care for him so much and it melts my heart. The first time I held Arthur in my arms, is a feeling I cannot describe. Just to be able to look at his little features, and take all of him in. to come to the realisation that our long awaited little boy was finally here with us. I remember longing to hold him throughout my pregnancy longing for him to be here with us, and now he is, and it couldn’t feel better. Just writing my birth story has brought such happy tears reminding me of the day our lives changed forever. Each baby I have had has changed me and humbled me more then ever. It has been the greatest privilege of my life to have my three children and the memories of their births and nurturing them will never ever leave my mind. There will never be a day that I forget. Arthur is 5 weeks old and still here I am feeling as elated as ever. Feeling grateful and more so looking forward to watching him grow, my last baby, my little miracle, as are all three of my children. Not a day ever goes by that I will not feel blessed to have had each of you. Oh this is beautiful! Makes me broody! Such beautiful writing. This is just beyond beautiful and magical. Congratulations 🙂 I wish I had been able to feel the head when my second daughter was born, but she just suddenly appeared! What a beautiful birth story – I loved my labours and the feeling of bringing a baby into the world is amazing!